The Touch Computer TC55 is the best proof that a compromise does not need to look like one. With its 4.3” touch display, 3G, Android operating system, 8 megapixel camera and a real smartphone design, the TC55 has no equal. The TC55 is made for mobile workers in maintenance, delivery and customer service, logistics, etc. The accustomed Android functionality improves user performance. The touch computer’s communications capabilities are excellent. Fast 3G, HSPA+, 802.11 a/b/g/n Wi-Fi and Bluetooth 4.0 ensure that you always have access to real-time data, and from nearly any location. Communicate when and where you wish to – reliably and quickly. 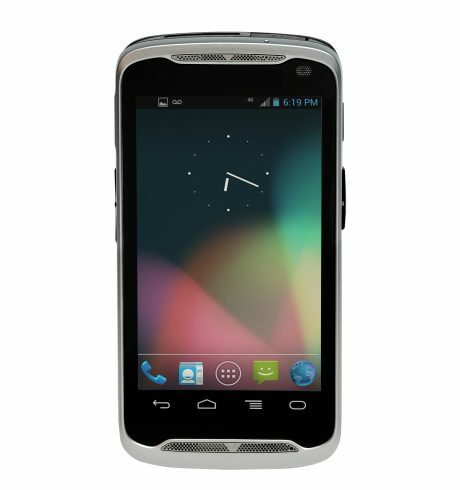 Its capacitive WVGA touch display allows for precise navigation with your finger or stylus for signatures. A brightness of 700 Nits makes viewing the display in the outdoors a real experience, for the best readability at all times. Inside a 1.5 GHz dual-core processor is hard at work for you. Together with 1 GB RAM it ensures for smooth processes and high speed. You may also expand the 8 GB Flash memory to 32 GB via the integrated MicroSD slot. Data capture is also child’s play with the TC55. An optionally integrated linear imager for 1D barcodes speeds up the on-site barcode capturing process. With the 8 megapixel camera or the SESE4710 2D engine, users additionally capture 2D barcodes and documents while in the field: for example, from samples, damaged packaging and production mistakes. With the help of the NFC module you read the corresponding data and information from machines and receive quick, reliable failure reports. The two front-placed speakers guarantee clear voice playback, even with background noise. The two microphones provide for clearer voice capture at any location, thanks to their noise reduction feature. With a weight of a mere 220 grams, just like a smartphone, the housing of the TC55 more closely resembles that of a rugged device: robust Gorilla glass, IP67 certification providing complete protection against water and dust, as well as vibration and drop resistance certification MIL-STD-810G. The TC55 withstands 150 drops from a height of a half meter without problems. What this means for you is that no matter how tough the environmental conditions are – in pouring rain, at a construction site, outdoors in snow and ice – the TC55 is your reliable partner.